A LAWSUIT HAS RECENTLY BEEN FILED AGAINST SET TV IN THE STATE OF CALIFORNIA. ORDER THIS SERVICE AT YOUR OWN RISK. It appears that SET TV has been shut down. Popular alternatives include Eternal TV and Area 51. This step-by-step guide will show you how to install SET TV IPTV on Android Box. This same process will work on an Android phone or tablet as well. This tutorial will work on any Android device that is equipped with an Internet browser. As of this writing, SET TV is the most popular IPTV service due to it reliability and HD quality streams. 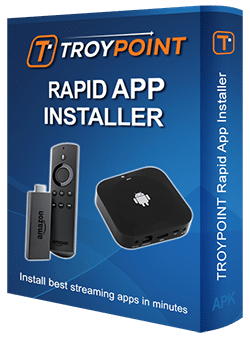 Important Disclaimer, TROYPOINT does not verify the legalities of any IPTV services or streaming applications covered through any TROYPOINT media properties. Users should always use a VPN in conjunction with free or low-cost streaming services or apps such as SET TV to protect their identity and encrypt their connection to the Internet. Below, you will find a video that goes through the important details that aren’t covered in the general steps outlined above. TROYPOINT suggests paying on a month-to-month basis when using IPTV services. If for some reason, the service discontinues or a better alternative comes about, you can easily switch. SET TV IPTV serves up over 500 HD channels that you would normally find in a cable or satellite subscription. Sports enthusiasts love SET TV due to NFL, NBA, NHL, and MLB seasons passes. The service also delivers Pay Per View sporting events! 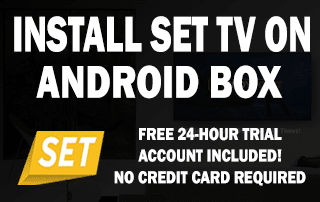 It is simple to install SET TV onto an Android Box by using the instructions above. If your device is running any version of the Android Operating System, chances are that this method will work great. SET TV sports a nice looking user interface and it is simple to navigate with an Android Box remote. An electronic program guide provides users with updated program information at their fingertips. The service also comes with a separate channel directory that allows channel sorting by category. As of this article, the following categories are included; All Channels, English, Sports, Spanish, USA, UK, Filipino, and Adult. The adult channels require a pin code and the default is 1234. You can change the adult code within your online SET TV account. One feature that doesn’t get as much attention as the Live TV section is the On Demand offerings. SET TV provides subscribers with hundreds of the latest movies and tv show episodes. You may also find my tutorial on how to install SET TV on a Fire TV or Fire TV Stick. If you require support, you must contact SET TV directly by using contact information on their Website. You will also see a chat window appear on their site after you have been there for approximately 30 seconds that can also be used for support. To update SET TV on an Android Box, simply go through the exact same process outlined above. Once the installation file has been downloaded, it will ask, “Do you want to install and update to this existing application?” Click OK and the update will install. The url shortcut used above will always be pointing to the most recent SET TV installation file. Support requests must go directly through SET TV by using directions outlined above. Support questions posted in the comment section of this post will not be displayed due to the fact that TROYPOINT does not legally represent SET TV. Hi Victor, you can’t, they have closed shop. They no longer exist. If you have an andorid box you can install any IPTV service such as Eternal TV or Kodi Solutions IPTV. It appears that SET TV has been shut down. Their app is no longer working and Website is offline as well. This is one reason why we always suggests paying on a month-to-month basis for any IPTV service. Popular alternatives include Area 51 – https://troypoint.com/area-51-iptv/ and Eternal TV – https://troypoint.com/install-eternal-tv/ If you get out of stock error for Eternal TV, keep checking back for when they accept new customers. If I exit set tv- how do I find it again on my Android home screen? It should be listed under All Apps. Wifi keeps cutting off on android box. What do I do to get it working? Hi Troy: I recently installed Set TV on my H96 Pro Plus and am pleased with it so far. Now I would like to use a VPN. Can I install the VPN as your video shows since I have Set TV already, or do I install a different way? I have read comments that people are having trouble with their Link Codes not working after connecting to a VPN. Hi Randy, you can use one outside IP address with SET TV so when IPVanish is connected, only one connection on your account will work. Hi Troy, They now have an APP put out by Net2go.com and apparently this APP works in every part of the world? Not sure about this as it is developed by a company with absolutely no infrastructure? Your comments on this please?